This is really cool! I want one ... I mean I'd like to at least drive one. Even that will probably never happen. Especially, you know, since the end of the world is on Saturday. It has often been said that you should never meet your heroes because you’ll likely be disappointed. For better or worse, one of mine is a car. Born five years before me, the 1965 Ford Mustang Shelby GT350 was already a classic by the time I reached the age of automotive awareness. 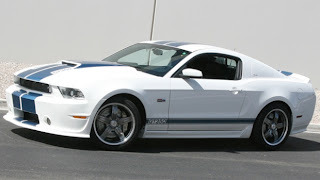 The first real thoroughbred Mustang, its Guardsman Blue stripes over white livery remains iconic today, and pristine originals command prices well into the six-digit range. That being the case, I’ve resigned myself to the fact that I’ll probably never get the chance to drive one in anger on a racetrack. That opportunity certainly passed a couple of decades ago.